Though SUWA Yorishige takes up arms ignoring the alliance with TAKEDA Harunobu, he makes peace with UESUGI Norimasa after all. 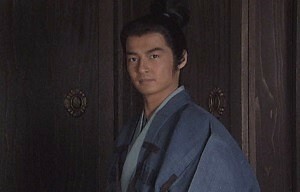 It disappoints SANADA Yukitaka who hopes to destroy the Takedas. TAKEDA Harunobu is bewildered. If he fights against SUWA Yorishige, his sister Nene, wife of Yorishige will face danger. Then Kansuke proposes to him that it needs to cause discord between the Suwas and the Takatos, branch family of the Suwas. Harunobu and Kansuke visit the hot springs. Harunobu talks about "The Art of War" by Sun Tzu and Kansuke speaks of "Furin Kazan". In their absence, Nobushige visits Oi Fujin with senior vassals and tells her that they worry about Harunobu who always accepts the words of Kansuke. Oi Fujin says that he may be a good companion for him. Then ITAGAKI Nobukata appears and says that Kansuke probably knows how Harunobu thinks. 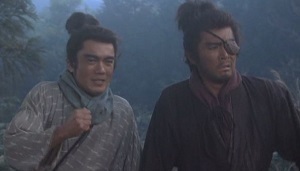 Kansuke and KYORAISHI Kagemasa depart for Takato Castle. As they plan to behave that the vassals of the Takedas lack unity, TAKATO Yoritsugu. lord of the castle gets carried away. Then they go to Suwa in a chilly wind. On the way, Kansuke finds Heizo accompanies Hisa, daughter of YAZAKI Jugoro. Heizo brings them to his master’s house. At supper, Kagemasa tells Jugoro that he hopes to serve Yorishige because he dislikes the Takedas. Needless to say, it is the scheme of Kagemasa. Jugoro accepts it and keeps him as his shokkaku (dependant**). 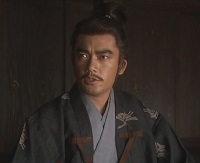 And Kansuke also says that he is a ronin who searches somebody whom he should serve. Heizo loves Hisa but she is going to ARUGA Kiyomasa, lord of Aruga Castle. She worries about that her family will die out in the future but Jugoro tells her that there’s no problem if one of her sons secceeds him. Kagemasa tells Kansuke if Harunobu attacks Yorishige, the Yazakis will have a direct influence. At that time Omiwatari(***) appears on Lake Suwa and a Shinto Ritual is held at Suwa Shrine. Yu-u hime attends it and people gather there to see her. But according to the divination at the ritual, an evil god from the east will cause misfortune. And Sanjo Fujin asks Harunobu not to attack Suwa but think of Nene. Harunobu says she is a hostage and didn’t marry Yorishige of her own will but Sanjo Fujin says so is she. She still worries that Yamamoto Kansuke hopes to trigger a war. Harunobu also plans to construct banks to prevent villages from floods and he finds a young man called KASUGA Gengoro among Kawayokeshuu, those who oversee dredging and constructing banks. Harunobu knows that he is acquainted with Kansuke. Kansuke returns from Shinano and meets Harunobu. 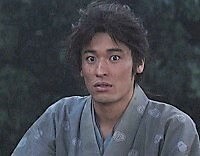 Then he is surprised to see Gengoro there. He is employed by Harunobu to serve him as his attendant. Harunobu makes the flag of “Furin Kazan” and shows it to his vassals. ITAGAKI Nobukata tells them that Harunobu is always ready to have a battle and they rejoiced at it. (*) Japanese style pronunciation of Sun Tzu. (**) The system of treating a talented man as guest and he supports the head of family instead. It is said to originate in ancient China. (***) Ice cracks appear on frozen Lake Suwa. The word means "god crossing" because there is a legend that it's the path marked by a god who visits a female god by crossing the lake. 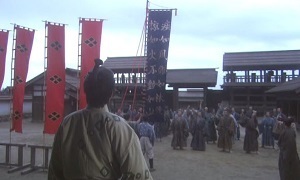 The images are from the video of "Furin Kazan"
Heizo is a fictional figure. He is a farmer who lives Kuzukasa in Kai with Densuke (later KAWARAMURA Denbei), his sister Mitsu and Takichi (later KUZUKASA Takichi). The appearance of Kansuke influences his life. After the death of Mitsu, he takes the charm of Malici offered on her tomb and leaves Kai. 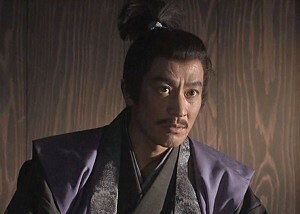 He hopes to attack TAKEDA Nobutora who killed Mitsu. Then he serves the Sanadas and joins the Battle at Unnokuchi Castle with Kansuke. After the battle he parts from Kansuke but falls ill on the street and is saved by YAZAKI Jugoro, vassal of the Suwas and his daughter Hisa. He becomes to serve the Yazakis and loves Hisa secretly. As Jugoro serves the Suwas, he still hates the Takedas though Harunobu becomes the head. After the attack on the Suwas by the Takatos and the Takedas, Jugoro serves OI Sadataka and then MURAKAMI Yoshikiyo and he continues to serve him. Later he marries Hisa and calls himself YAZAKI Heizo. But Jugoro is killed by the soldiers of SANADA Yukitaka in the battle at Toishi Castle in 1551. And Yoshikiyo who is betrayed by some of his vassals escapes to Echigo at last. Then Heizo serves the Uesugis who rule Echigo. He is ordered to tempt a young monk called Chokyu into killing Harunobu. He was born between Suwa Yorishige and his wife Nene but was forced to become a priest in his childhood. But it ended in failure and then he serves USAMI Tadamitsu, senior vassal of UESUGI Kenshin and participates in the fourth battle of Kawanakajima. During the battle, he sees a man who is familiar to him. It is YAMAMOTO Kansuke who is dying but he is shot by arrow and falls down on the ground. After a while he stands up and tries to walk to Echigo where his wife Hisa and children Jugoro and Mitsu live. It is not clear whether he survives or not. She was a daughter of TOYOTOMI Hidetsugu and a concubine of SANADA Nobushige. Though her father Hidetsugu, his concubines and children were executed in 1595, she could evade it and became a concubine of Nobushige. Her real name is unknown but it is true that she was officially called Ryuseiin. She gave birth to his daughter O-Den in 1604. During the Siege of Osaka, she and her daughter lived with Zuiryuin (Nisshuni, mother of Hidetsugu). Later O-Den married IWAKI Nobutaka, lord of Kameda domain in Dewa, current Akita and Yamagata. She dedicated the armour with the six coins, family crest of the Sanadas to local temple Myokeiji. In this series, she is described as a woman who eludes the pursuit of TOYOTOMI Hideyoshi's soldiers and escapes to Luzon (the Philippines) by the good offices of a merchant called NAYA Sukezaemon. She once visits Nobushige and his family, Kiri and her father Naiki in Kudoyama and brings them a flat braid. As they have trouble making a living there, they make braids imitating it and villagers sell them. BABA Nobuharu was a vassal of TAKEDA Nobutora, Harunobu and Katsuyori. He was formerly called KYORAISHI Kagemasa. He called himself Baba Nobuharu when he was allowed to inherit the family name of Baba later. He was granted the official title Minbunosho first and then Minonokami after HARA Minonokami Toratane retired. He was a late bloomer. He became to command 120 mounted soldiers when he was 44 though some vassals commanded about 300 soldiers in their forties. He is said to have never injured himself in the battles he joined in his life (*) so was nicknamed "The Invulnerable Baba Mino". YAMAMOTO Kansuke is said to have taught him fortification and he constructed some castles includes Fukashi Castle in Shinano. He died in the Battle of Nagashino in 1575. He was succeeded by his son Masafusa who was killed or executed when ODA Nobunaga invaded into Kai in 1582. The house of his descendant is preserved in Matsumoto, Nagano. In this series, he has a close relationship with Kansuke. Besides learning fortification, he and Kansuke maneuver in Suwa in preparation for the attack of Harunobu. He made his name in attacking OGASAWARA Nagatoki, shugo of Shinano and the fourth Battle of Kawanakajima. (*) He is similar to HONDA Tadakatsu, vassal of TOKUGAWA Ieyasu in this respect.